Alejandra Guzman, Alexis y Fido, Arthur Hanlon, DJ Snake, El Dasa, Fanny Lu, Farruko, Gente de Zona, Gerardo Ortiz, Ha*Ash, Jencarlos Canela, Jesse & Joy, Luis Coronel, J Balvin, Kany Garcia, Papayo, Paty Cantu, Paulina Rubio, and Zion & Lennox make up the final line-up of stars that will perform at this year’s Billboard Latin Music Awards “Billboard Duets.” They join previously announced performances by Alejandro Fernandez with Camila Fernandez, Banda Sinaloense MS de Sergio Lizarraga, Daddy Yankee with Don Omar, Juanes, Juan Gabriel, Lucero, Marc Anthony, Marco Antonio Solis, Natalia Jimenez, Nicky Jam, Victor Manuelle and Yandel. For the first time in its history, the Billboard Latin Music Awards will be presented as a special edition titled “Billboard Duets,” and all musical performances will feature an exclusive duet or a collaboration between performers made possible only by Telemundo. The network will broadcast the longest-running and most prestigious awards show in the Latin music world on Thursday, April 28th at 8 pm/7 CT, live from the BankUnited Center at the University of Miami in Florida. 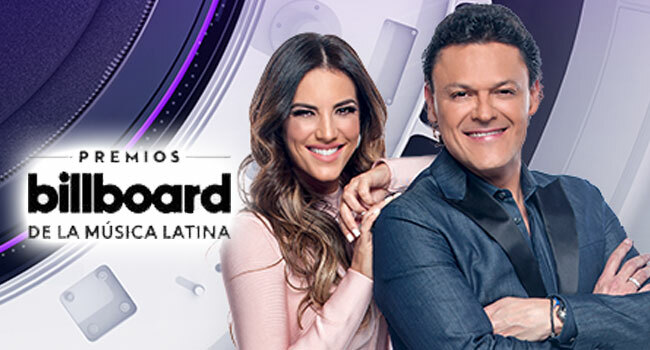 Hosted by Gaby Espino and Pedro Fernandez, the awards show will also feature a long list of coveted presenters, including: Adriana Lima, Andres Cantor, Andy Samberg, Angelica Vale, Blanca Soto, Carmen Aub, Don Francisco, Dr. Ana Maria Polo, Edith Gonzalez, El Dasa, Fernanda Castillo, Giselle Blondet, Maria Celeste Arraras, Michael Buffer, Natalie Morales, Patricia Manterola, Rafael Amaya, Raul Gonzalez, and Roberto Tapia. The program will be preceded by the red carpet special “La Alfombra de Premios Billboard” airing live at 7 pm/6 CT. The one-hour show, which will showcase the glamour and excitement of music and TV stars arriving on the red carpet, will be hosted this year by Telemundo personalities Rashel Diaz and Jorge Bernal; co-hosted by Jessica Carrillo, and featuring Fashion expert Quique Usales. Additionally, to enhance the viewer experience, Telemundo will roll out a comprehensive digital and social media strategy featuring exclusive, highly engaging candid and unexpected moments. The Digital backstage will recreate a custom limousine to create slow motion videos of moments in luxury and style featured on the Latin Billboards and E! Online Style Instagram accounts. The TeamTelemundo Snapchat account will be the exclusive platform for the backstage show “Snapstage”, which will include interviews and use of fun filters and doodles. Additionally, Telemundo will partake in Snapchat’s official live story, alongside content from fans, celebrities and influencers. For the first time at the Billboard Latin Music Awards, the Red Carpet will be streamed via Facebook Live, showcasing hosted video content featuring the hottest stars of the night, with fashion commentary, interviews and live fans participation. Lastly, fans can virtually walk the red carpet along star Sabrina Seara (El Señor de los Cielos) just like a celebrity in 360 video available on Facebook and YouTube. Following the awards show, the night will culminate at 11:35 pm/10:35 CT with “Premios Billboard: Acceso VIP,” a special that will give audiences an exclusive behind-the-scenes look of the awards ceremony. The program will be hosted by Jessica Carrillo, co-hosted by Karim Mendiburu, with fashion expert Quique Usales and social reporter Erika Csiszer. The 2016 Billboard Latin Music Awards “Billboard Duets” will also broadcast throughout Latin America and Canada, and viewers in those countries can tune in to: El Salvador (Canal Dos), Costa Rica (Canal 6), Dominican Republic (Teleantillas), Ecuador (RTS), Guatemala (Canal 7), Nicaragua (Canal 10), Paraguay (SNT Cerro Cora), Peru (ATV), Venezuela (Canal 10), Panama (TV -Max canal 9), Mexico & Latam (Telemundo Internacional), Mexico (CH 52), Colombia (CitiTV), Canada (TLN) and Honduras (Televicentro).